Andrei Filote grew up in a world on fire. Violent joy is writ in the blood of man, who writes history in the ink of his violent self. Vicious and cruel, he does not let pity or doubt bar the way to his desire. If a mountain stands in his path, the mountain shall be split. If a million men should separate him from his goal, a million men will die with as much perfunction as a million sheep. The best of them are pragmatists, the Napoleons, the ones who build some common good out of the piled bodies. The worst of them are short lived butchers, the Alexanders, those who spend lives only to leave vacuums of spiraling death in their wake. And look at their many victims, envious opponents carrying the same bloodlust, but too weak to win. Does humanity deserve to exist? This question stews in the background of the new God of War, a reinvention whose serious seriousness is a bit humorous at times but also accomplished and loquacious. It’s a story that transforms the infantile smashing of the original trilogy into a broader statement about how we inherit and transmit violence. Once a stand-in for thrill-seeking players, Kratos becomes a symbol of humanity’s journey from its most heinous impulses to the dream of a better self. To follow his original story is to be the last of the sane witnessing an ineluctable descent into madness. It’s a pathetic truism, but the peaceful are the only ones who can take up arms, and inevitably they do. God of War now wants to know if it’s also possible to lay them down. Violence is tradition as well as instinct. Across the series, violence propagates by example from parent to child in a startlingly determined show of toxic masculinity. Kronos seeks to devour his children who he fears will supplant the ruling titans. The attempted filicide gives Zeus a first hand education in ruthlessness. Spirited away to safety, the child takes the lesson to heart, bides his time, and, having become a man, starts the very rebellion Kronos feared. Zeus wins the war, setting up a cosmic order that will bring generational trauma for eons to come. The master beats the clumsy apprentice, the husband the impertinent wife, the mother the unruly child. This hideous stuff of everyday living is material for the epic grandeur of fathers mutilating children, as the furious Zeus does to his brilliant son Hephaestus. The list goes on. Ares yearns for his father’s approval. He turns his mortal half-brother Kratos into the perfect warrior, an ironic Greek punishment whereby the father-protector’s own fury leads to the death of his loved ones. Kratos murders Ares, Zeus retaliates, and nothing is spared. The gods who are family, the ancient Greek heroes who are Zeus’s sons, the institutions of the Greek universe are doomed. Moron among morons, Kratos destroys everything, from his own flesh and blood to the very order of the physical. All that remains is his own wretched existence. What does Kratos amount to as he crawls, half dead, from the smoldering corpse of his father? The cycle of violence is fulfilled more completely than ever. Looking upon a world returned to primordial chaos, he judges himself more than equal to those he cut to pieces. He knows he is the worst of them. In his youth, Kratos glories in the broken dead. He struts bloodsoaked into harems and the bed of Aphrodite. When he struggles, he rages. When he wins, he broods. The gods don’t have a middle ground. They are made of absolute truths layered on each other like strata of sedimental diamond. In them are the hours of the infinite and everything that humans do and dream. Love of love or love of war, it doesn’t matter. To be divine is to be indiscriminate and merciless, an absolute truth that fuels Kratos’ suicide at the peak of Mount Olympus. The man hates himself as much as the gods, and his last lonely bit of wisdom, bought at the cost of ultimate folly, is that the last enemy that we shall destroy is us, ourselves. 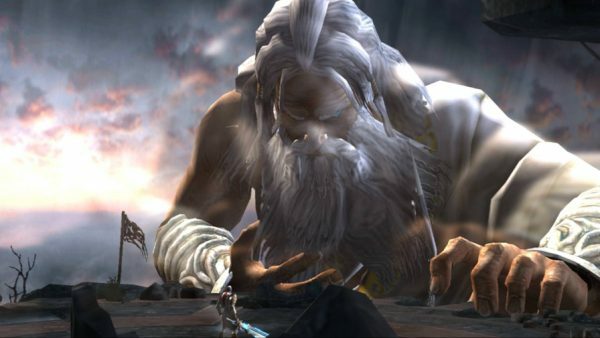 But Kratos survives the ravages of bloodied Olympus and travels where he is unknown, and begins again. Does he deserve it? “Deserve’s got nothin’ to do with it,” replies Clint Eastwood’s retired outlaw in Unforgiven, a film that God of War imitates perhaps too closely. The character, a notorious murderer, settles down with a woman who cures him of his rage, gives him a family, and passes on to a world more worthy of her grace. Likewise Kratos finds new love and meaning in a woman and the son she gives him, a beat-by-beat retread of Unforgiven’s premise. The women save their men, but not forever, just as humanity’s wisdom gives only fleeting comfort before history’s monsters reappear, pen in hand. True to form, when we explore Alfheim, we witness a civilization split in two, at war with itself for so long, conflict is the only value left. Midgard is not so far from Greece. Just as the developers at Santa Monica Studios hunger for stories more profound than B-movie schlock, a transformed Kratos searches for a better way. He laments to his late wife that “our son is not ready,” extols the virtues of discipline and restraint, and looks soberly upon a world he knows must boil over time and again with meaningless sound and fury. Every lesson he conceives is designed to attack his past weakness. Like so many characters who seek redemption through their one virtue, Kratos finds salvation through his shame and holds onto it as if it were a ward against his personal evil, the blind rage that fueled so much heedless killing. 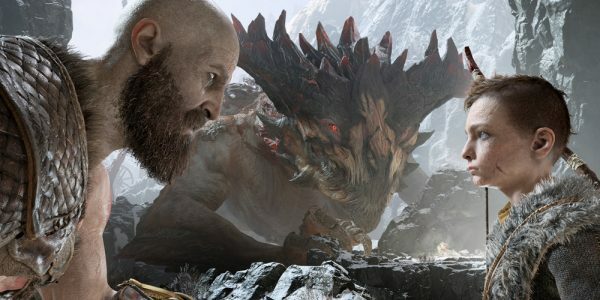 Familiar themes resurface when Kratos and his son, Atreus, face off against enemies who are the failed sons of exacting and capricious fathers. Never encountered in the flesh, these patriarchs are sung of and worshipped, prayed and sacrificed to. Their statues are silent but overbearing. To see the results of their fatherhood is to know them as they really are: tyrannous old men who leave marks like welts on their children’s souls. Valhalla, the Allfather’s afterlife, accepts only those who die fighting. Of children, the old and feeble, the disarmed, that is, the best victims, Odin does not care, barring them from paradise. Let the helpless crowd the icy wastes of Helheim. Those who are fit to kill belong on Odin’s side. And much like the hapless mortals who murder each other seeking Odin’s favor, Baldur roams blindly in search of a key that will not lead to his freedom but gives Odin some advantage. Meanwhile, Magni and Modi, sons of Thor, rampage across the realms only to be humiliated for their mistakes and beaten for their failures. What a sad fate it is to be raised by shameless fathers, either molded in the image of their evil, or punished by it. In a way the child does not outgrow the father. What is taught is put in, brick-like, until not even as an adult can they be blamed for practicing the parent’s lessons. Though each man must answer for himself, does it not hinder his prosecution when a nation of misbegotten children answer in chorus: my father taught me? And though one day can be the difference between belonging to a guardian and belonging to oneself, when we judge we pretend as if it were one lifetime. We ignore that Sparta raised Kratos to be their killer, and Odin raised Thor to be his. Kronos taught Zeus to strike rather than reconcile, Zeus taught Ares, and Ares found Kratos. Baldur is not the main antagonist, but the latest product of a self-perpetuating legacy of hate. Although he fights against the two, Odin’s son is one of many mirrors of Kratos, a damaged man, and one of many possible futures for Atreus, an all-powerful bully. Tragically common, the family’s mistakes are not overcome, they are reproduced. Eerily similar to Kratos, Baldur’s protective enchantment is a bit of ironic punishment and its own statement: to be free from pain is to be free from living. And it drives one mad enough to kill a parent, another lesson he picked up from Odin, who, before marrying Baldur’s mother, tried very hard to take her life. When the saga begins we stand behind Kratos and witness the evil of his folly, never truly identifying with such a villain. Our perspective is different now. It is the power of storytelling to show that everyone deserves mercy, even such monsters as Kratos and Baldur. The game loses its trainwreck insanity, but it leaves us with something the originals never cared about: an idea worth considering. So here is one. That what Atreus must confront is not Thor, God of Thunder, but his own monstrousness which is not rage but the guiltless joy of being almighty. In other words, Atreus’ natural opponent is his own father whose lessons he challenges every step of the way, whose teachings he can’t truly accept until their source is revealed. Kratos escapes one catastrophe and enters another. Though he himself strives to be better, the forces around him play out age-old human tragedies, sweeping up the old god and his son in their pitiless contests. The irony is not lost on Kratos, who once drove a world to the brink, while the defenseless watched in despair, as if if it was not a man that raged, but history itself. So he resigns himself to uncharacteristic fatalism and accepts mankind’s violent destiny, knowing he has achieved something his father never could: raised a child who won’t need to ask forgiveness. That is a mercy of a kind. Andrei Filote lives somewhere between the Alps and the sea. He writes about all things games. You can tweet him at @letominor.